An executive credenza and lateral file was custom made for a Milwaukee law office about 25 years ago. Richly figured walnut has a banded top and superb renewed finish. Superior quality vintage office or library furniture, the maker's signature is lost. Drawers have solid oak dovetailed sides, finished interiors and heavy embossed brass pulls. 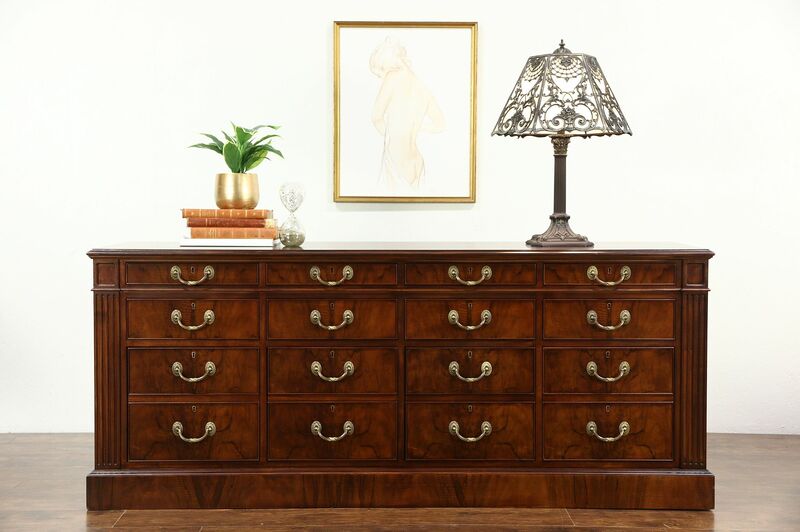 Corners have fluted classical moldings and there are four hanging file drawers. The matching desk in photos is priced and sold separately, contact us for availability. Dimensions are 6' wide, 21" deep and 30 1/2" tall.